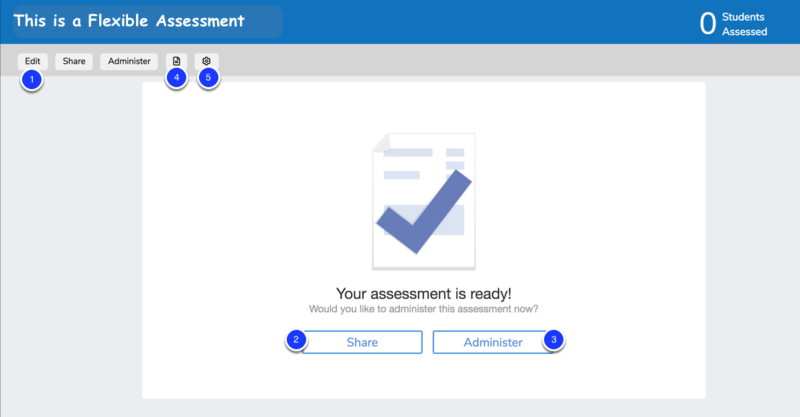 This lesson will give you an overview of navigated the Flexible Assessment Landing page in Illuminate. Implementation Tip! Consider how you will train and guide users to access their data using our new Flexible Assessment Overview and how this may differ from their use of our Itembank and Manual/Hybrid Assessment Overview page utilization. Pilot groups and early adopters may be the best audience for this new FLEX assessment. When you first visit an assessment, the Flexible Assessment Landing page appears to be blank. Without student responses, the page prompts the user as to the most appropriate next steps to Share or Administer. Continue to Edit the assessment's design as needed for expected results. Share with colleagues to use with their students. Administer the assessment to students. Upload Materials to support students with online testing, teachers with PLC's, grade level data dialogues, etc. Apply Advanced Tools to the assessment such as Performance Bands or apply the assessment to an Assessment View. Until you have administered the test, student data, reports and the ability to analyze that data will not be available. 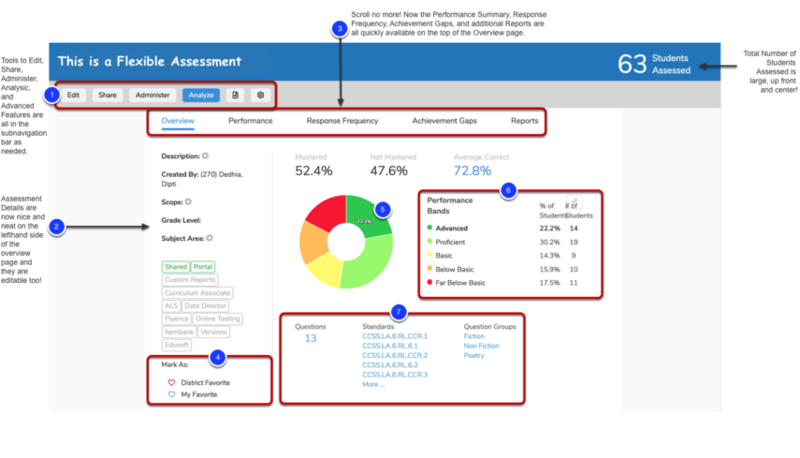 Once the assessment has been administered, the page allows you to Analyze the results. Student Response Data will populate and provide access to further review results with reports and data information based on the assessment's design. If and when necessary, you have access to all Editing tools. Notice that Analyze is highlighted as the page you are currently on. Assessment Details are available as previously selected on the left hand side. Various Reports are available right on top, for quick browsing and review of your student data. Mark the assessment as a Favorite to find it on the View Assessments, Tile or Data Dashboard faster. A Performance Donut Graph displays the total counts and percentage of students within in level of mastery in the applied performance band. A Performance Band Chart provides a table-like breakdown of the total counts and percentage of students within in level of mastery in the applied performance band. The total number of Questions, Aligned Standards, and Aligned Question Groups may appear for quick and easy review of the assessment's goal and structure. Now that you are familiar with the landing page, start Administering Your Flexible Assessment! Have ideas to make us better? Join our Focus Groups who help with design and feedback throughout the year. Contact help@illuminateed.com to join.